Nigerian Federal Government played drama again in court by not proving their case legit. When the case of IPOB and Federal Government was called up at about 10am, Prophet Nnamdi Kanu being extracted, now three defendants in a roll, Benjamin Madubugwu, David Nwawuisi and Chidiebere Onwudiwe, Bright Chimezie was absent. Immediately, the prosecution led by Mr Labaran Shaibu told the court that Mr Bright was in the premises and should be given 5 minutes to come in. Eventually, Mr Bright was brought in an hour later by the DSS. 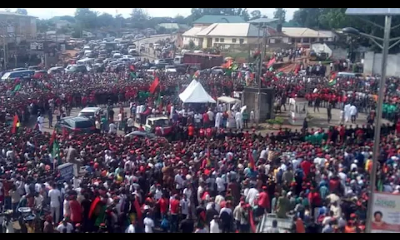 Apparently DSS prepared to frustrate and divert attention of the court, Mr Labran again told the court that IPOB members posted a photo short of a DSS personal on the social media to be tracked and killed, immediately IPOB defense team countered him and made the court to understand the ploy, then the court granted the defense plea and threw away the application. Bright Chimezie's lawyer progressively forwarded to the court saying that the amended charges brought for prosecution was only served this morning which amounts to the gross disobedience to clear the directive of the court previous date, however, to be served within time. After some insignificant heated argument by the defense and prosecution, the defendants eventually took plea of not guilty to all the charges rated. 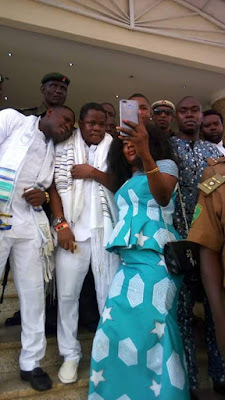 IPOB defense team made an oral application again for Bright Chimezie to be transferred to Kuje prison and the judge, Binta Nyako granted the request, henceforth this evening Bright Chimezie Ishinwa will be taken to Kuje prison to be with the rest of his brothers. Finally, almost 3 years of adjournment, still counting though, the hearing was hereby adjourned again till Thursday, 22nd March 2018 for the defending council Bar. Ejiofor and team to understudy the amended charges. "It is quite clear that the federal govt is not ready for this case as their lawyers just served us this morning in a bid to ambush us the defence lawyers with the amended charges and we are going to respond tomorrow so we are coming to the court next tomorrow Thursday..
Also we are waiting for the 15 days given to buhari and his govt by the AU's human and persons right commission to maintain the status quo to notify the court officially which if they obey is going to affect even this court proceedings because the order is to stop every actions against IPOB until the matter is settled by the commission".